The "Selenus" sets were typical of Germany and Northern Europe and named after Gustavus Selenus, the pen name of Augustus the Younger, Duke of Brunswick-Lüneburg, author of the Chess or the King's Game (German: Das Schach- oder Königsspiel), an important chess manual published in the early 17th century. There are chess pieces pictured in the book, but of different form than the model we call "Selenus" today. The standard includes delicate lathe turned bases and shafts and tiers with galleries resembling crowns. Pieces were distinguished by heights, the number of tiers and sometimes by symbols. In England they were frequently called "Tulip" chess sets, because of the shape of the middle sections of the King and Queen. The pieces are very fragile and easily damaged. The sets are very common, but complete and undamaged sets are scarce. You will notice that some sets listed here are rather damaged. There are 11 typical "Selenus" sets listed here, followed by some others which are disputable "Selenus" sets. It is difficult to date these sets accurately. They have been made a long period and the shape didn't change that much. My theory, but not proven, is that in older sets the King has only one gallery, the galleries are not pierced, King and Queen do not have the feather finial, or only the King has a feather, and bishops have not a flower like top. Of course not all of these aspects act always together. The ivory "Selenus" set of the late 19th century is scarce because almost all "Selenus" sets have been made of bone. That set is a bit unusual of form as well. The set estimated early 20th (late 19th?) century is an exception, because it has the old characteristics, except for fragility. Actually I think it is a later reintroduction of an old set. There exist also new Indian reproductions of the "Selenus" type set, which are easily recognizable because they are uncouth and miss the elegance of the antique sets. Unfortunately I do not have an example of it. These sets came mostly in a small pine box with a sideway sliding lid. I did not make pictures of the boxes always. Set no. 7 is interesting because it comes with associated roll-board and chess box. We have seen such combinations with a "Nuremberg" set as well. Note that the ivory "Selenus" set came in a carton box with compartments for the pieces. This lead or pewter set is more a curiosity. I'm not sure that it counts as a "Selenus" type set. These 2 bone sets, sets without galleries, are a “Selenus” type according Strouhal, but "Nuremberg" is used too, because the type appears on a Nuremberg pattern sheet of 1840/1850. This type is, in the English world, sometimes called "Spindle" set. At last a wooden set which is hard to categorize. Although it was said Polish, probably because of the indication on the box, I believe it is a German set with characteristics influenced by both "Selenus" and "Toy" sets. I think it has been made in same region, and probably by the same makers, as the "Toy" sets, which came in shaker boxes as well. Germany, Ore Mountains, "Selenus inspired"
German "Toy" sets are named so, because these sets appeared in the German toy catalogues of the mid to late 19th century. These sets are most likely made in the Ore Mountains. But we have seen them also in Nuremberg pattern sheets from the mid-19th century. Specific on those sets is that there are some figural aspects. You always see small faces and mostly hair and hoods and so on the pieces. In spite of being somewhat figural, are these sets well suited to play with. Those sets came in shaker boxes as far as I know, but those boxes have been lost very often. I do not have a "Toy" set with its shaker box. Knowing this, then this list of sets starts with a set without the typical "Toy" characteristics, as no faces are drawn on the pieces. However, the whole set is just in line with the "Toy" sets. "Régence" sets of Germany are, just like the French, hard to date. However, the history of the German "Régence" sets does not go that far back as the French. I believe mid to late 19th century are the oldest. I do not have one. Sometimes it is even hard to tell what the origin is. The first set you see has been bought in Vienna and could be Austrian as well. Other sets listed below could be French, from Sudetenland or Polish. But I have listed the sets here because of what I think is most likely. Germany or Austria, "Régence alike"
The following 5 sets are, I think, 20th century and German. Maybe the 1st one is French. The 3rd set could be Czech or Sudetenland and may be much older (based on comparison with the Csech, Sudetenland set). The set from Oberlausitz could be Polish, but that's only a few km away from Oberlausitz. All 5 are cheap sets. No real value for the true collector, but just informative. Except the 1st are they rather small and not very suitable for normal play. Maybe they are intended as travel sets, but then I miss the boards. Box/board was part of the deal! "Staunton" sets did everywhere take over as a standard to play with. From 1924, when also the FIDE declared them standard for their tournaments, it became the type to use. The 1st set is a beautiful presentation set of which some said that it could be Uhlig, but I do doubt that strongly because some specific characteristics are not seen. Especially the very own cross on the King, as well as the characteristic form of the Knight. Of course this exquisite Knight is not comparable with the usual Uhlig Knights. There are ivory Uhlig sets in a presentation box known with all pieces as the ordinary bone sets of Uhlig and the Uhlig catalogue does mention an ivory set, but there is no drawing. Germany, is it Uhlig?, "Staunton"
The 2nd set is a nice and bit unusual ivory Staunton set of late 19th or early 20th century. I do not know if series production of German ivory Staunton sets actually existed. The 3rd set is a bone set made by Uhlig. These common sets are recognizable by the specific Kings cross, the construction of the bases and the typical Knights. The example here has its original box with original paper the pieces were packed in. The 4th set looks at first site like a bone set by Uhlig, but that's not the case. The set consist of a kind resin/plastic from the Leuna Chemiewerke and has been most likely made/turned by the Firma Zänker in Rothenthal. The 5th set is reminiscent to Jaques, but has no makers name nor any mark (crown) on Knights and Rooks, so I think the set has been made for the continent. The set came in a French box/board, but I bought it in Berlin, so I assume it is German. Set 6 is a Lardy pattern, which was also produced by Hempfling, Bohemia, Homas and others in license. Clasp has inside "GES. GESCH." (gesetzlich geschutzt=legally protected). I assume the set is Hempfling because of the similarity with the 7th set. But I have seen a Bohemia set in a box with similar clasp. Then I think: that clasp could have been used by many manufacturers. Germany, by Hans Hempfling in Nuremberg? "Staunton"
Set 7 is a Lardy pattern, which was also produced by Hempfling, Bohemia, Homas and others in license. The logo on the box is Hempfling, so this set has been made by Hempfling. Germany, by Hans Hempfling in Nuremberg, "Staunton"
Set 8 can't be attributed to a specific maker. If someone knows more, then contact me. This board was originally part of a little table. Closed you would see the nice burr-walnut side on top. 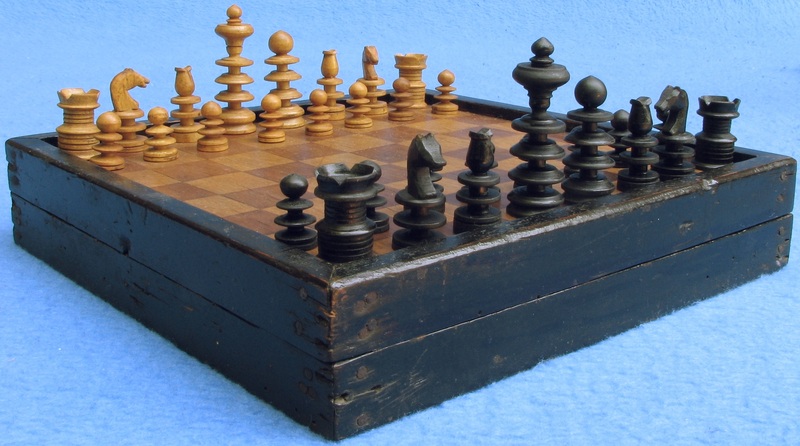 Then you could turn it 90° and open it to reveal the beautiful inlaid chess and "molenspel" (mill game) board. This well known "WMF" chess sets exist in different versions. The most common have silver and gold metal pieces in a cassette covered with cloth. There exist also one with a metal cassette. This one has painted pieces in a naked cassette. The sets were made by the Württembergische Metalwarenfabrik as promotional gift I believe. Next a set which is often confused with the English "St.George" style sets. Those sets must have inspired these German sets. English sets are mostly made of boxwood and ebony or rosewood, but the German ones are made of lesser quality wood. I think Maple. This is a Staunton inspired silhouette chess set in original box. This war time set was bought on Ebay, but seller could only tell that the set was made in a German concentration camp, but not by whom or in which camp. He got the set from a relative who did not tell him, and he didn't ask. Would have been nice to know more of the history of this intriguing set. Now we can only guess how it was made and used. This Bakelite alike plastic set is around WWII released as promotion and advertising by Werner & Pfleiderer in Stuttgart and Tamm, who produce machines for plastic processing and bakery. Next two sets, called "Modern" and "Piramid", are made by Kahe Pasch, the artist name of Karl Hermann Paul Schäfer. Kahe Pasch is a German furniture maker, but has already made some designs of chess sets, which he produces in an edition of approximately 20 in his small basement workshop at home. I love these simple abstract designs, which are made of nice woods with great precision. Kahe Pasch made very nice boards as well, but I do not have one. The sets are suitable to play with, although I have to say that the pieces of the "Piramid" set tend to fall out of your hand because of the tapered from.